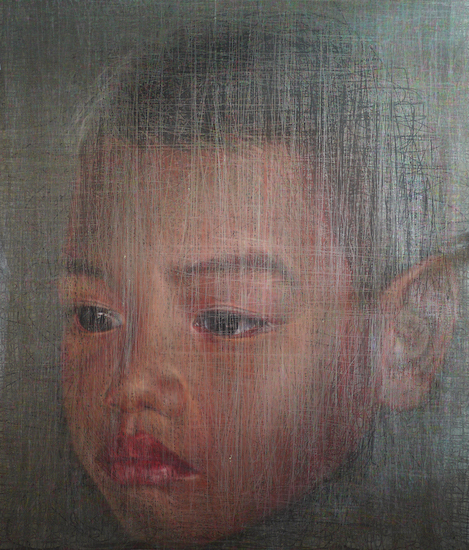 Yavuz Gallery is pleased to present Thai artist Uttaporn Nimmalaikaew in Dimension of Hope, his second solo exhibition in Singapore. 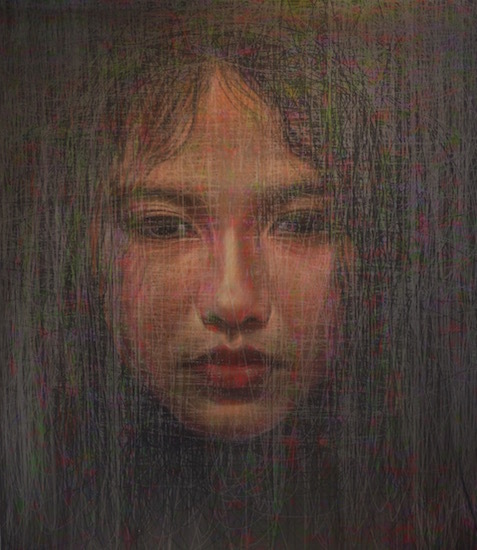 Winner of the prestigious Sovereign Asian Art Prize in 2006, Nimmalaikaew has established himself as one of Southeast Asia’s most exciting new generation artists through his unique mixing of media, manipulating and combining traditional techniques in an innovative new way. 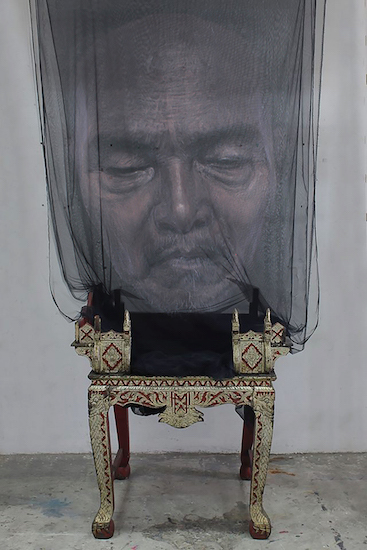 Nimmalaikaew’s signature work consists of layers of sheer fabric and netting, set within a deep frame or hanging from the ceiling over real pieces of furniture, with pieces of loose thread and coils of fishing wire deliberately draped and woven throughout. 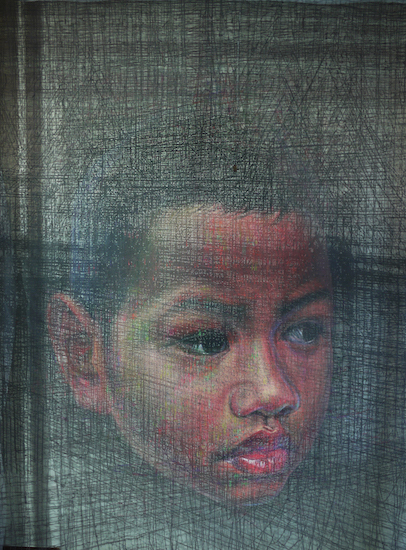 The artist then carefully hand-paints or screen prints his figures on each layer of fabric and thread, resulting in mesmerising three-dimensional, ‘holographic’ scenes that seem to shift with our own movements, as we peer deeply into the glass to study each layer, or take a step back and around to consider the whole. 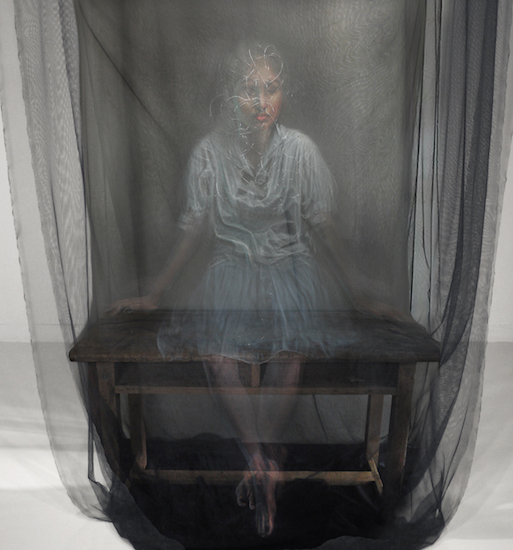 Dimension of Hope introduces the artist’s newly developed technique of framing his mixed media works within a clear acrylic encasement, further elevating the appearance of weightlessness and incorporeality of the artist’s painted portraits. A devout Buddhist, Nimmalaikaew’s practice is grounded in Buddhist philosophy, and Dimension of Hope continues to explore these themes, particularly on ‘dukkha’, a central term in Buddhism most commonly used to describe suffering or disatisfaction in mundane life. These nine new works dive into the anxieties and uncertainties of contemporary life, brought about by significant political and social changes around the world. 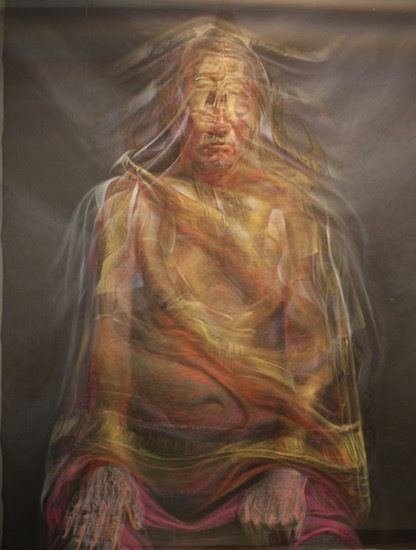 Based upon the artist’s own family members, these ethereal portraits depict people in different stages of life – some afflicted by worries of their young future, whilst others question the state of Buddhist faith and mortality in their old age. Yet, these new works on view are hopeful, rather than morbid as its title suggests. There is a meditative quality to the works, a sense of understanding and acceptance of life’s anxieties as the artist weaves his thread through the delicate layers. Though inspired by Buddhist thought, the show’s thematic concerns are universal: suffering and sadness; change and uncertainty; impermanence and mortality; the cycle of life and death. Nimmalaikaew presents quiet scenes that ask for pause and contemplation, to consider life as the artist does.